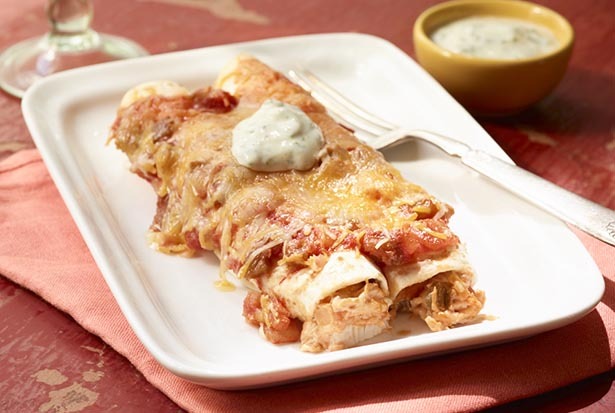 These easy, mouth-watering enchiladas are stuffed with cheese, chicken and salsa and topped with yogurt, cilantro and cumin. To prepare sauce, combine yogurt, cilantro and cumin. Cover and chill. Heat cream cheese in large skillet over medium heat until soft. Stir in chicken and 1/2 cup salsa; mix well. Add 1/2 cup shredded cheese; stir until melted. Spoon about 1/3 cup chicken mixture onto each tortilla; roll up. Place seam side down in 13-x9-inch baking dish. Top with remaining salsa and cheese. Bake at 350˚ for about 15 minutes or until heated through. Serve with yogurt sauce.